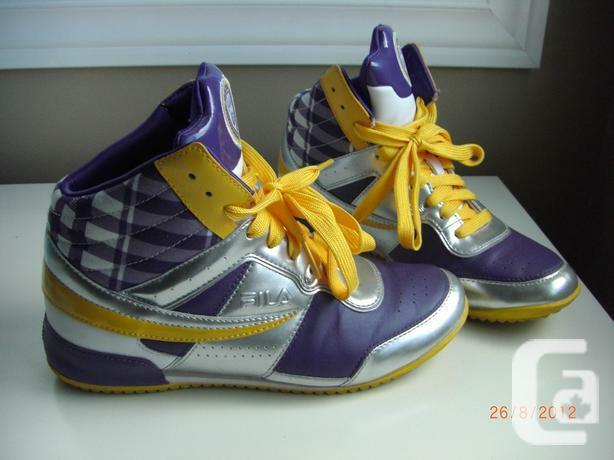 Selling a pair of Big Bang Limited Edition FILA high-top sneakers. Size 6 (but if your a female size 5, you can wear these loose on you, I'm a size 5 female but these sneakers are UNISEX, for guys if you fit into a 6-7, these might fit you) Bought from Korea, not available in Canada. Very rare sneakers. Very fashionable, purple and gold edition(T.O.P style). If you're a BIG BANG fan, then these sneakers are for you, a collector's item. Colourful sneakers, unisex, guys and girls can wear these sneakers. Be the envy of your friends and get these shoes now. I love these shoes and all my friends are jealous that I own these. But the shoe isn't my style anymore so I've decided to sell them to someone who will cherish these shoes. Check out my other items for sale, awesome stuff! Pls contact me with any questions, serious buyers only. Cash only, must be picked up at public location.